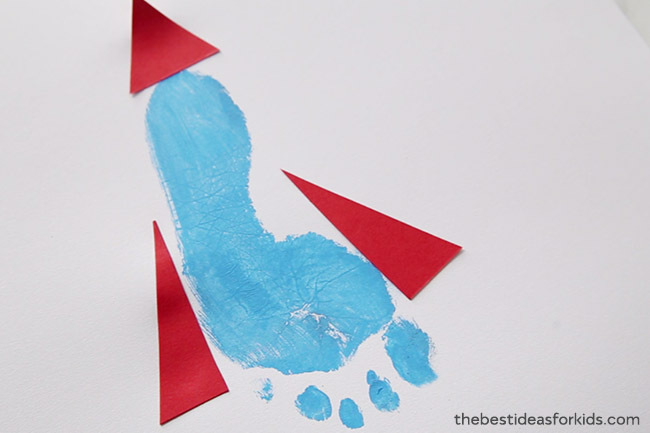 With Father’s Day coming up we are sharing this adorable footprint rocket craft that you can make for Dad. 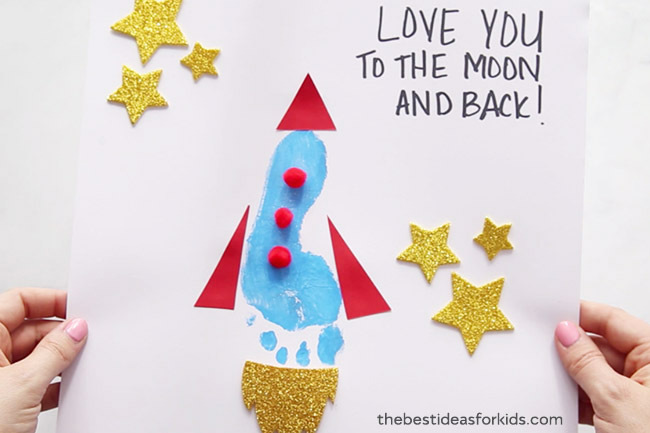 We love that it says “Love you to the moon and back” but you can change this to any other saying like, “You’re out of this world Dad”. Or you can simply put Happy Father’s Day and frame it. 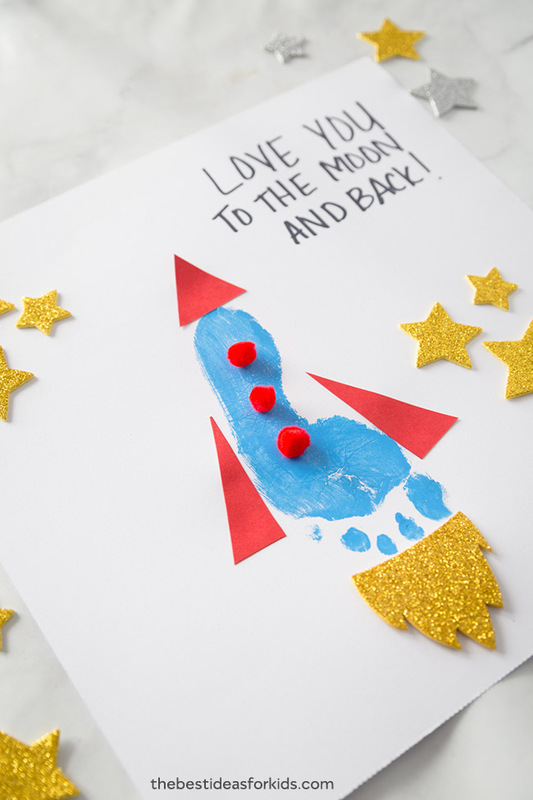 Footprint crafts make the cutest keepsakes for Father’s Day. You can make this and frame it for Dad and he’ll treasure it for years to come! The best part about this craft is you only need a few supplies to make this handmade gift for Dad. 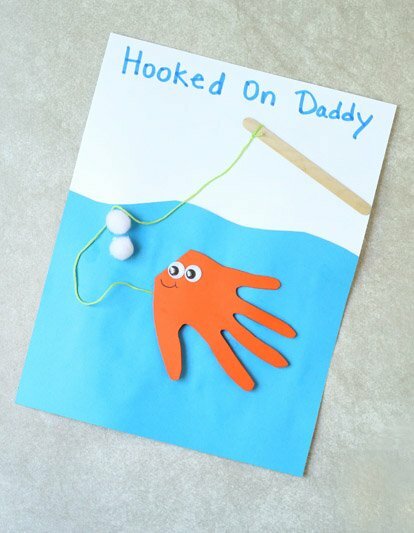 We also have a lot of handprint crafts you can make for Dad including this handprint fish “hooked on daddy” card. – Large white cardstock – you’ll want to make sure you get a paper size big enough to fit the footprint but also the wording. Also keep in mind the framing size if you want to frame it. 1. First make sure your white cardstock is big enough to fit the footprint and the rocket top and flame. 2. 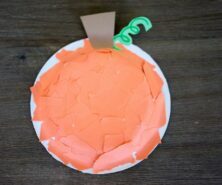 Put your paint on a paper plate. We used acrylic paint but we actually recommend this washable paint brand. Since you’ll have paint all over those little toes it will be easier to wash off with a washable paint. Acrylic paint is fine also, just make sure to wash it right away and not to let your kids put it in their mouths. 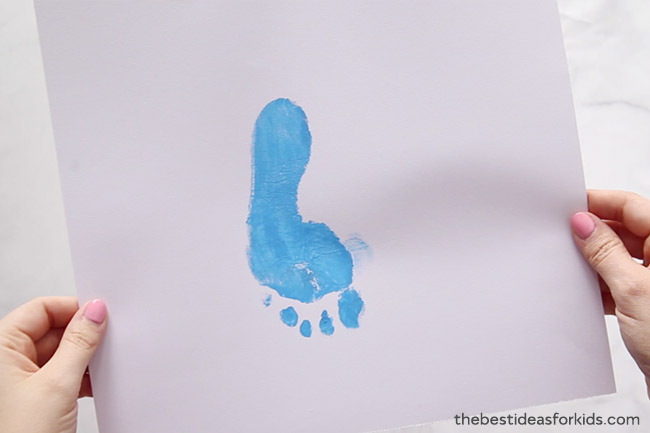 Press the foot into the paint and stamp on a few pieces of paper. You may have to do a few tries before you find one that looks good. If you get a footprint you like but it’s missing a bit of paint on the inside just use a paint brush to fill in the missing areas. 3. Cut out 3 triangles for your rocket. For the sides of the rocket, trace a triangle shape and then use that to trace a second one so it is the same size. Glue to your paper. 4. 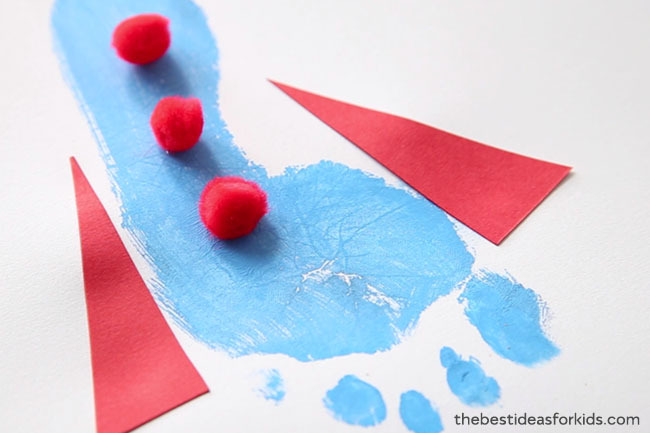 Add your 3 small pom poms on top of your footprint. We like to use this brand of non-toxic glue for gluing on pom poms since they can fall off easily with regular glue. 5. 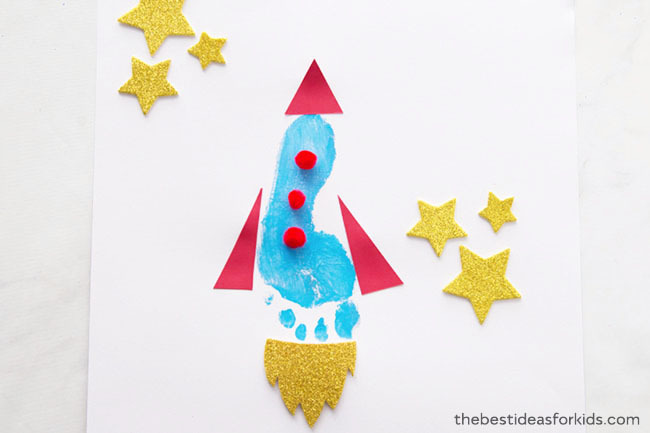 Cut out a flame for the bottom of the rocket using your glitter foam paper. We just drew on the back of the paper what we wanted it to look like and then cut it out. 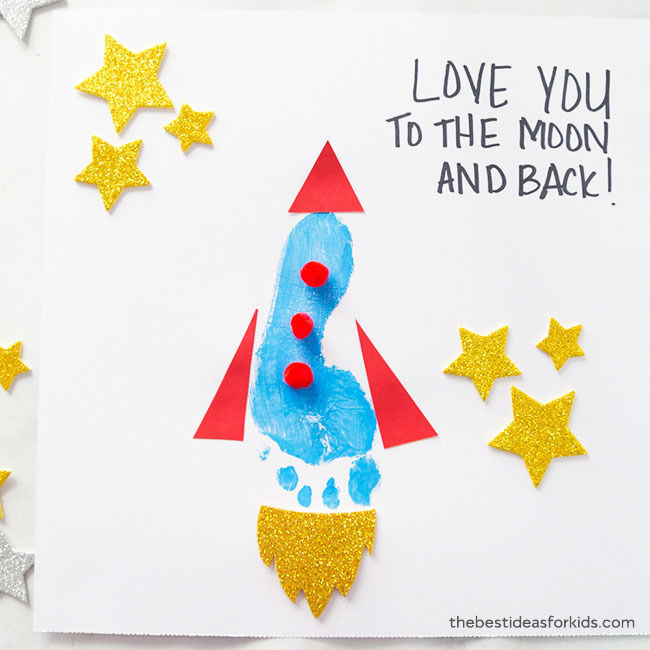 Also cut out your stars and glue to your paper or place glitter foam star stickers down. 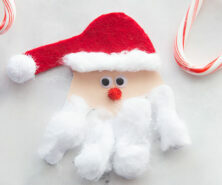 We love how simple and easy this craft is to make! Dad will surely love getting this for Father’s Day or even as a birthday gift! See this fish handprint card – the fish opens up to write a message inside. 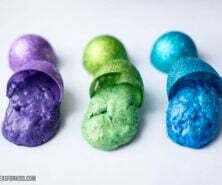 Also see 25+ Handmade Father’s Day Gift Ideas – there is something for everyone on this list of easy crafts to make for Dad!